More high hopes and impossible dreams from the Trump administration, China’s electric future, Tesla’s strict NDA practices target unions and much, much more for The Morning Shift on Thursday, Sept. 27, 2018. You’re here, reading this, so I assume you probably love JDM vehicles. But it’s not just us in-the-know types; Americans in general love Japanese cars. In fact, 40 percent of cars sold in America are from Japanese companies, according to Bloomberg, but only 0.3 percent of cars sold in Japan are brands from the U.S. The Trump Administration has been going after perceived trade disparities all year now, and the next target is Japan. How do we even those scales and get the Japanese to buy more American rides? Trump announced Wednesday he had reached an agreement with Japanese Prime Minister Shinzo Abe to open trade talks between the two nations. The president had threatened a 25 percent tariff on cars, seeking to deter imports and encourage more production and jobs in America. Trump, who also wants better access for U.S. cars in Japan, agreed with Abe that sanctions on auto exports won’t be applied while the talks take place. It seems it’s just American cars that get snubbed by Japanese buyers. Imports from German automakers make up seven percent of cars sold. The best performing American brand in Japan is Jeep, which has sold 7,000 cars so far this year. But here’s the problem: American car companies simply don’t make the kinds of cars the Japanese want to buy. By and large, they never have. In Japan some of the top-sellers are compacts and even ultra-compact kei cars; meanwhile, over here, we’re abandoning the small car market entirely to embrace the crossover, truck and SUV explosion. Basically, neither stick, nor carrot will lead Japanese buyers to American cars, and with the influx of CUVs and SUVs on the market, there seems to be even fewer options to tempt Japanese buyers. 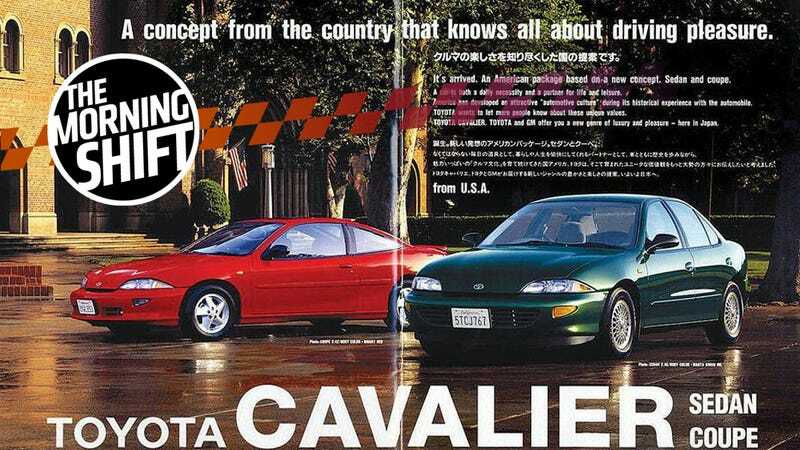 They may also still be mad about the Toyota Cavalier. Perhaps President Trump should start by apologizing for that. Electric cars are slowly catching on here in the U.S., but half of all electric cars sold in the world are sold to Chinese buyers. And much like their Japanese neighbors, they prefer homegrown brands. One of the innovators the Chinese people can thank for promoting EVs is a fellow named Wan Gang, who gained support for electric vehicle development two decades ago when most of us where still discovering rechargeable batteries for our remote controls. Of course, China’s government is pushing hardest for EV development, but Wan’s being hailed as a kind of Elon Musk for that country, possibly in an even bigger way. in an initial public offering in September. Wang Chuanfu, the billionaire founder of BYD, China’s biggest maker of NEVs, recalled meeting Wan in 2014. “I was impressed by Wan’s obsession with clean-energy technology,” he said. China is set to build one million EVs this year. And nowadays, as goes China, so, too goes to the rest of the world. The Asian market is at it again! This time, it’s Japan’s Panasonic that is swooping in to help Tesla out of it’s production jam by adding three new production lines by the end of the year at Tesla’s Gigafactory. Panasonic is actually ahead of the schedule in building these additional lines, probably a first at Tesla, though the company hasn’t given an exact date. The National Association of City Transportation Officials, Ford, Uber and Lyft are teaming up with the digital non-profit SharedStreets to gather data on how the public really uses streets in an effort to make traveling them safer, cleaner and more efficient. What does that mean? Time will tell, but the finding will be open and free to access for municipalities and policy makers. Anyway, ride-hailing apps have largely only added to traffic congestion and road wear. About time they take responsibility for some of that. Cadillac is moving its headquarters back to Detroit (well, Warren, specifically) and as we called it yesterday, it’s largely being seen as an indicator that the focus on brand-building and marketing above all else was largely a failure. The original move occurred under de Nysschen, however it was believed then-Cadillac CMO Uwe Ellinghaus, who started before de Nysschen and left the company at the beginning of this year, was a main proponent of the New York headquarters. “Cadillac’s move to New York made sense in theory, but in practice it didn’t address what Cadillac really needs to turn the brand around — a laser focus on the product,” said Jeremy Acevedo, Edmunds’ manager of industry analysis, in a statement. “Moving the headquarters to Warren, where the heart of GM’s design and engineering teams are, is a big statement that Cadillac is serious about bringing the brand and product visions together. Neutral: American Cars In Japan? Besides our sports and luxury cars, and Jeeps (everybody loves Jeeps), what would Japan want?